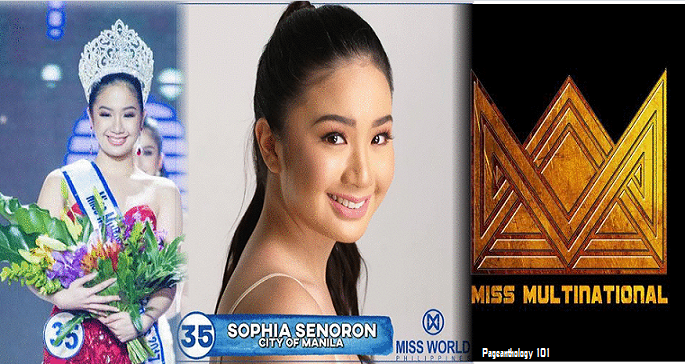 She may be the youngest candidate, but that notwithstanding, Sophia Senoron has given pageant enthusiasts good reasons to take notice of her. 17-year-old Varsity Debater at San Beda Debate Society Sophia Senoron was crowned Miss Multinational Philippines 2017 at the Miss World Philippines 2017 coronation night on September 3, 2017, at MOA Arena. She was crowned by Miss World- Oceania 2016 Madeline Cowe from Australia and will now go on to compete in the inaugural edition of Miss Multinational pageant to be held in New Delhi, India from December 6th - 20th. Miss Multinational Pageant is owned by Glamanand Entertainment Pvt Ltd, Nikhil Anand, being the chairman of the company. At 5'4" tall and has no beauty camp (Independent), Sophia may not be the favorite to win at the competition but she stood out for her sheer eloquence. She was applauded by the MOA Arena audience during Q and A portion. Q: What would you advise a 7-year-old girl who dreams of becoming a beauty queen? A: I think at a young age we start our aspirations and we start to have inspiration for what we want to be in life. And that's something that I've experienced being only 17 years old and making it this far. I would tell it to a 7-year old that not to make a beauty pageant for goal but to make what she wants to do with the pageant .... inspiration. I'm talking about wanting to be able to help the world and show the world what our country can and should be. Or what our country can do for the other people and for our future as well. And I think that's what goal that all beauty queen should have. Sophia may be young, but she has a lot of wisdom in her head. An aspiring lawyer and a varsity debater, she loves immersing herself in different social and political issues in the country, even favoring topics that are philosophical and controversial. She advocates for training student leaders, along with the group she helped form, Ang Pagbabagong Mithi (A New Aspiration), to spread awareness on different issues of the nation. Congratulations and we wish you the best of luck with your competition in India!